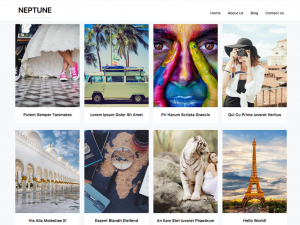 Neptune Portfolio is a unique theme that delivers amazing imagery for your adult blogs, portfolio sites, or tube sites. With a standard four column grid supported by masonry , you’ll always expect a perfect design no matter which device you are on, be it your iPhone, android phone or desktop. Neptune Portfolio is already translated to Spanish, French & Portoguese and 100% translatable to any language WordPress already supports.